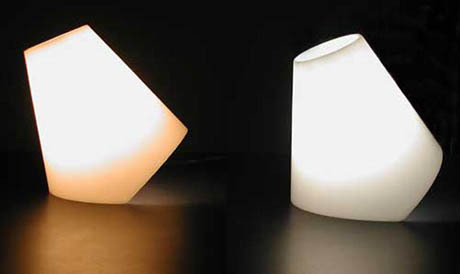 The On/Off Lamp | OhGizmo! In what is perhaps a rather artistic admission that it does indeed take grace and fine motors skills to operate a simple switch, the On/Off Light gives you an entirely different way of interacting with it. It’s base is cut at a 45 degree angle. On one side, it’s on. On the other side, it’s off. So, when it’s time for bed, simply slap the thing, and off it goes. If, in your overeagerness to slap something, you push it off the night table altogether, you’ve no reason to worry: it’s made from practically indestructible soft thermoplastic. It’s available now, in light pink or light blue for $45.